MYRTLE BEACH, S.C. (Oct. 01, 2008) -- About 250 injured or ill Soldiers participated in a workshop last week to prepare themselves for either retention in the Army or transition to the civilian world. The "Heal, Help, Hire" or "H-3" training workshop as it is called, was held for the third time Sept. 22 to 27, hosted by the Installation Management Command, in Myrtle Beach, S.C. Attendees at the training site included Soldiers who are presently in the Medical Evaluation Board process from injuries, illnesses or conditions sustained in the Global War on Terrorism. At the workshop, Soldiers learned about the benefits, entitlements, accommodations and opportunities available to them as they transition. Spc. Jonathan Stark speaks with Tim Virgilio of the Veteran's Administration Atlantic Health Care Network at the transition resource center during the Heal, Help, Hire conference Sept. 22-27, in Myrtle Beach, S.C. During the transition resource center, Soldiers could talk with representatives of 45 various federal agencies, civilian companies, assistive technology companies, healthcare providers, universities and schools provided Soldiers with information about options in the civilian world. What all the Soldiers had in common was the need to prepare for a change -- from where they are, to where they can choose to go. Some Soldiers --after going before an Army medical board that will determine next steps and options -- perhaps will go into a different career field/MOS, back to their unit or transition out of the active Army. The H-3 conference has been designed to poise and prepare both groups for the changes and choices afforded to them, officials said. "Our objective is to provide access and opportunity for training, knowledge and resources [they need] to make fully informed decisions -- said Michael Lariosa, the H-3 program manager." "The Army wants to assist Soldiers with their transition. If that means becoming a veteran, civilian employee or being retained in the Army in another occupation with assistive technology and retraining -- we will make sure that happens by ensuring they receive the appropriate process and POCs." During the H-3 conference, Soldiers and their spouses attended workshops conducted by subject matter experts and representatives from private sector, federal agencies, resource and service providers to learn about benefits, education, medical treatment and job-placement assistance. "[The speakers] put out a lot of information we were not getting elsewhere," said Staff Sgt. Kandi Temple, who is currently assigned to the Warrior Transition Unit at Hunter Army Airfield at Fort Stewart, Ga. They provided a lot of inspiration, too, she said. "Every Soldier in a WTU should be able to come to one of these [conferences]." Temple, a former member of the 30th Military Police Battalion's Criminal Investigation Division, suffers from progressive damage to her body, the result, she said, of marching with a rucksack on her back that contained as much as half her bodyweight. She won't be staying in the Army, but will try to get into civilian law enforcement. She'll no longer be able to do detective work, but would like to be an instructor and is using her time in the WTU to prepare for that transition. "I've used my time in the WTU to finish two degrees I started working on before I joined the military," she said, adding that the WTU Cadre supports her efforts to prepare herself for the day she's no longer in the active Army. "If I wanted to go to the local police department, my squad leader encourages me to do that, because it'll help me when I get out of the Army." Spc. Michelle Frasier was part of the Special Troops Battalion for the 4th Brigade Combat Team, 3rd Infantry Division at Fort Stewart, Ga. Her husband, also a Soldier, is currently in Iraq. She is now also part of the WTU at Hunter Army Airfield because of physical conditions involving her feet. "I've gone before the [medical-evaluation] board to get my job changed. I'll be a mental- health specialist in the Army, said Frasier, who plans to complete coursework toward that goal and then seek a commission. She said the H-3 conference provides great support and opportunities both to Soldiers, who will eventually become civilians, and to those who will stay in the service. "The networking here is phenomenal," she said. Many Soldiers, who are preparing to leave the service and didn't know what to do next, will now know what their next steps must be. "When I get to be an NCO, I'll be able to help those Soldiers," she said. 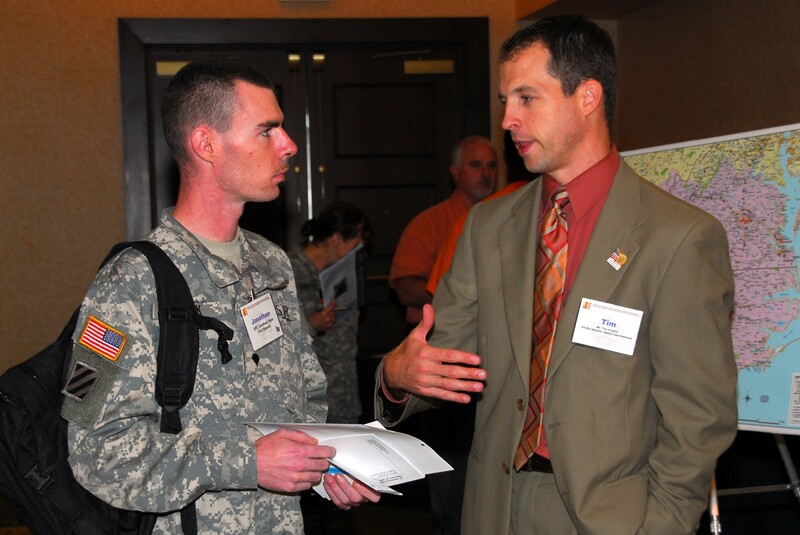 The H-3 conference included a resume lab that helps Soldiers convert the military language they use to describe their Army jobs into language a commercial company's human-resources manager could understand, said Naomi Lynch, Chief of the Army Career and Alumni Program Office at headquarters, Installation Management Command. "How do you take the job of a forward scout and turn that into civilian terms?" asked Lynch. She had earlier helped a Soldier do just that. "He said he'd go out and make sure other Soldiers were safe, and that he'd report where the enemy was. Well, that's a great opportunity if you're thinking of working for Border Patrol or looking at intern positions at the FBI or other federal security forces. He said he'd never thought of that. Lynch said it is important for Soldiers in transition to give them credit for what they contributed to the Army. Oftentimes, she said, Soldiers simply consider what they do as "doing their job." But really, she said, what they have done for the Army can be translated into civilian terms, and in order to do that, Soldiers must learn to be comfortable taking credit for serving their country. Soldiers at the H-3 conference were also able to participate in the "transition resource center," where representatives of 45 various federal agencies, civilian companies, assistive-technology companies, healthcare providers, universities and schools provided Soldiers with information about their options in the civilian world. "It looks like a job fair, but it's much more than that," Lariosa said. Both the resume lab and the transition resource center were resources Staff Sgt. James Kirby, a Maryland native, hoped to take advantage of while attending the H-3 conference. "I really don't have a plan right now, that's why I'm here at the conference to get which direction to go," he said. "They are going to help me set up a resume, let me talk to employers and turn my resume into them. That'll help me get in the door and help me get a civilian life down the road." Kirby has collectively served in the active Army, the National Guard or Army Reserve for 23 years. Today he is assigned to the Community-Based Warrior Transition Unit in Virginia Beach, Va. His injuries stem from an incident in 2005, when, as a member of the Maryland National Guard, he was activated to serve in Iraq. "I was servicing one of the vehicles in the motor pool there and the tire came off. The weight of it overwhelmed me, destroying my shoulder, my back and my left knee," he said. A medical-evaluation board let Kirby know his time in the Army would be over, but he said he doesn't believe the Army is throwing him out -- quite the opposite. "Since I got back, this Virginia unit has been the best ally of an injured Soldier," he said. "[Its members] have guided me and let me know they are going to take care of me, and help me find a job before I get out. They have been giving me the answers I need. They are not throwing me out; they are helping me process to the civilian side." It's not just Kirby who is impressed with the CBWTU in Virginia and the importance and significance of the H-3 conference. His wife is also impressed. "She has been appreciative that we have this," he said. "When Vietnam was going on they didn't have this. This shows that the military cares about its own. They are looking at us and asking if we are being taken care of, that's all I've heard since I entered the program. About 13 conference attendees represented the WTU at Fort Gordon, Ga. Among them was Lt. Col. Michael Washington, commander of the unit's Company A, and four other members of the WTU cadre. Washington said he is impressed with the progress the Army has made in helping injured or ill Soldiers transition from either one Army job to another, or to a civilian career. "The Army has put everything in place to assist them with finding work," he said. "The resources are there, the support networks are there. And it continues to evolve for the better."